First time author April Sinclair, has officially launched a Kickstarter campaign for ‘FLU’, a children’s book aimed at helping children understand the influenza virus, its dangers and how it spreads. Chattanooga, TN - First time author April Sinclair, has officially launched a Kickstarter campaign for ‘FLU’, a children’s book aimed at helping children understand the influenza virus, its dangers and how it spreads. The Kickstarter campaign aims to garner widespread support and financial backing to print, market and distribute the book. 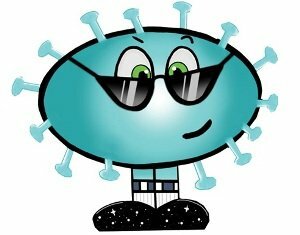 Flu is a uniquely written book that seeks to educate children on the influenza virus. The book features the character ‘Flu’, aka the Influenza Virus, a fun loving dancer and traveler who traverses the world. An avid party goer who has the unfortunate side effect of making people sick when he dances, Flu continues to provide his services unabated. Its only when Officer Fever calls in the Med Squad that Flu makes a quick getaway. With the penning of her first book, Sinclair wants to reach children and help them feel more included and special. In addition, she wants to offer real world assistance to those fighting childhood diseases. “At least 50% of the profits from books on more specific illnesses especially ones that put children in hospitals, like Leukemia and rare cancers, will be donated to either research for that illness, hospitals, parents who struggle with the mounting hospital bills, or organizations who volunteer their time to help children such as the Shriners.” said Sinclair. "Flu" is a superbly written story that should be a part of every elementary school and community library collection for young children. It is the first book in an anticipated series of health related children’s books to be penned by Sinclair. Each book will touch on a different childhood illness, virus, or syndrome including some very rare diseases. Sinclair feels that no matter what sickness a child is facing they should have a book on their specific illness. She wants them to help them feel more included and special. “This [Kickstarter] campaign isn't just about me. It's about reaching millions of children all over the world and bringing a smile to their face. Thank you so much for your support. Winter is coming so I'll be dancing your way soon,” says Sinclair.